Property 15: Centenario, amplias terrazas y vistas. Beautiful Loft in quiet residential area. Property 17: Beautiful Loft in quiet residential area. Wonderful apartment in the center of San Sebastian, perfect for couples. 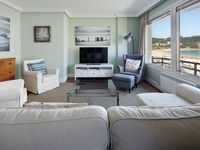 Property 22: Wonderful apartment in the center of San Sebastian, perfect for couples. Rural house Zabale (Ernio) in Aduna at 16Km from San Sebastian. Ideal for families. Property 30: Rural house Zabale (Ernio) in Aduna at 16Km from San Sebastian. Ideal for families. Property 34: Charming apartment five minutes from the beach of La Concha. Garage included !! San Sebastián Centro. Wifi and lift, 2 to 6 people. Beach100m. Bright. Property 41: San Sebastián Centro. Wifi and lift, 2 to 6 people. Beach100m. Bright. This is a lovely apartment in a fantastic position on the edge of the old town. Close to the market and supermarket and all of the bars and restaurants of the Parte Viejo. It is also waking distance to the RENFE and bus stations. Very comfortable apartment and we loved sitting on the balcony (overlooking the magnolia trees and the plaza), having friends over for dinner (food bought at the market) and walking out our front door to have everything that is wonderful about San Sebasti&aacute;n / Donostia so close. Miren and Carlos were also wonderful to deal with and kept communication flowing. We would be back for a longer stay in a heart beat! !